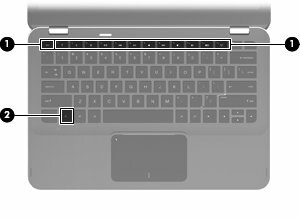 On most HP and Compaq notebook computers, it is necessary to press and hold the function key (fn) while pressing one of the f1 through f12 keys to activate the default functions; such as, increasing or decreasing the brightness of the display, the sound volume, sleep, keyboard lock, etc. On the HP Envy notebooks and other notebooks with advanced BIOS options, the function keys can be configured so that it is not necessary to press and hold the fn key. 1. Press the power button to turn on the computer. 2. 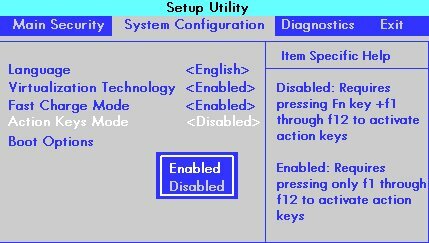 Press the f10 key to open the BIOS setup window. 3. Press the right-arrow or left-arrow keys to navigate to the System Configuration option. 4. Press the up-arrow or down-arrow keys to navigate to the Action Keys Mode option, and then press the enter key to display the Enable Disable menu. Disabled: Requires pressing and holding the function key (fn) while pressing one of the f1 through f12 keys to use the action indicated on the action key. For example, on some computer models, if the Action Keys Mode is Disabled, pressing the f11 key will minimize and maximize a web browser if open. Alternatively, pressing and holding the fn + f11 keys will mute the sound. Enabled: Requires pressing only one of the f1 through f12 keys to use the action as indicated on the action key. For example, on some computer models, if the Action Keys Mode is Enabled, pressing f11 will mute the sound as indicated on the action key. Alternatively, pressing and holding fn + f11 will minimize and maximize a web browser if open. 6. Press the f10 key to save the selection and restart the computer. The function key (fn) option can be reset at any time.